To build empathy with kids, read stories. Stories allow us to walk a mile in the shoes of another, in this case, someone who has experienced migration, immigration, or being a refugee. These are my favorite picture books and middle-grade chapter books about the issues surrounding immigration including refugees, migration, migrant work, deportation, poverty, and culture. I hope this list is helpful. It’s so important that we develop empathy. To do this we grow our understanding of the lives of other human beings. When we look at topic of immigration, be it undocumented or documented, we must see the stories…the perspectives of individuals who’ve experienced migration and immigration as well as who are refugees from their homeland. We must see the humanity. Large photographs pair with short sentences and phrases showing people whose homes are no longer safe, fleeing to safety. But where will they live? In a tent? Will it be hot and dry? Will there be friends? Questions will make kids understand the uncertainty refugees live with as they look for a new home. Photographs help kids see this is happening to real children in real life situations. Use this book to help your own children or students to empathize with children who are refugees. It’s really quite perfect for younger readers, not to mention important and timely. It’s a day like any other that starts with breakfast and a morning in school learning about frogs and volcanoes. After lunch, the war came. The writing and artwork allude to the destruction with only a few specific graphic details. “It came across the playground. It came into my teacher’s face. It brought the roof down and turned my town to rubble.” The girl is alone and must leave, walking and riding buses and going on a boat. She feels like the war is within her, in her dreams and in her heart. The story comes full circle when a kind child brings her a chair so she can attend the local school. “A chair for me to sit on and learn about volcanoes, and sing, and draw birds. And drive the war out of my heart.” I think this little girl’s journey is all the more valuable as we look at what happens after she arrives at the new country — it is only with help and kindness from others that she begins to heal. This is one of the best refugee experience picture books I’ve read. We can only imagine where this boy comes from… He walks away from his homeland with very few things carried on his back. Precise, sensory text perfectly narrates this little boy’s difficult journey… “Sometimes, in the cold right, I cry out to her in my dreams. / She comes with her black hair streaming, and tucks me in / with her flour-soft hands.” What imagery, right!? As the boy walks, he remembers his home. He remembers when they came. And all the walking. “One… / two… / three… / A line of humans like ants / crossing the desert.” He hopes that one day he will return home. I’m so impressed by Dave Eggers picture book, Her Right Foot, with gorgeous illustrations by Shawn Harris. As you might expect from Eggers, it’s FUNNY — I laughed out loud while reading. But, it’s more than that — it’s also interactive, informative, and insightful. In fact, this amazing book builds to a poignant and timely message about the meaning of the Statue of Liberty. Notice how her right foot is raised as if she’s stepping. Eggers wants us to notice that the Statue is moving. She is an immigrant, too. Her job of welcoming immigrants is active, never ending. Think about that for a moment. I think our country needs this book now more than ever. Step into the shoes of a young boy who wakes up early to go fishing with his dad. As they fish for their dinner that evening, Bao helps his dad build a fire and put the fish in a bucket. While they’re together, Bao’s dad remembers fishing in a pond in his home country of Vietnam. The blue-black illustrations and precise prose help us feel the stillness of the early morning hours and the strong bond between father and son. Later that night, the entire family gathers together to eat the morning’s catch. This moving autobiographical picture book of an immigrant family gives us much to appreciate and ponder. Based on a true story, this bilingual story (written in both English and Spanish) is about Alfred and his papa who leave their Mexican village to find work. They meet a “coyote” who is supposed to take them to the United States but they’re abandoned and must cross by themselves. Their journey is hard. Eventually, they arrive in Texas. Alfred begins school and learns English but he still misses his mother and siblings very much. After many years, he is reunited with his whole family. I loved the folk-style illustrations but wished there was less text on each page with better writing that was filled with more description instead of a retelling of events. Cartwheel arrives in a new country where no on speaks like her and everything sounds and feels strange and lonely. She meets a friendly girl at the park and they play on the swings but she still doesn’t understand what the girl is saying. But, the girl helps her learn new words every time they play. Soon Cartwheel begins to feel comfortable in her new home. Evocative graphic art illustrates in metaphorical and literal images depict first a dark world with war. After the father is killed, the mother tells the kids they’re going on an adventure to someplace safe. Their journey is filled with obstacles and loss. All the while the mother keeps the kids safe. And one day, just like the migrating birds out the train window, the family hopes to find a new home. Rama and her family must flee their now dangerous Syrian village to escape the escalating civil war. Transformative stone art collages show the family members walking with only what they can carry as they search for a safe place. A young boy named Francisco accompanies his non-English speaking grandfather to look for day labor and gets him a job as a gardener, even though he knows nothing about it. Farah struggles being new in a country where she doesn’t understand the language or culture. But a field trip to an apple orchard helps her find common ground with her new peers. Yoon loves writing her name in Korean but her father insists she must write her name in English. Yoon decides she isn’t sure about her name in English and wonders if another name would be better. Grandfather loves both his countries, his old country and his new one. Winner of the 1994 Caldecott. Unhei tells her new American classmates that they can pick out her name. But what name will she pick? Or will she find the importance in her own Korean name? With great sadness, a poor European village girl leaves her beloved grandmother for America. Peter and his father flee their burning village carrying suitcases and a treasure box holding a precious book, the only one that wasn’t burned by the enemies. At the last village with mountains looming and his father gone, Peter buries the box. He returns later, when it’s safe, finding the box and the book which he takes to the city’s new library to share with others. Amazing artwork! When her father dies, Esperanza and her mother flee from Mexico to the United States where they must work as migrant farm workers. A well-written, beautiful story that will stay with you. When Mari’s parents are deported to Mexico, she and her sisters are stranded in the United States, desperately worried about what to do next. This is SUCH a powerful story! Wow. This book is a tween must-read book. Not only are the stories compelling, it’s vitally important for kids to learn what it’s like to be an immigrant, particularly a refugee. Why? Because empathy is learned from stories like these. Follow three distinct, alternating stories to experience being displaced from your country, on the run, and in danger. First is a young Jewish boy who escapes from Nazi Germany on a ship to Cuba, only to be turned away from the Cuban port and sent back to Europe. Next is a Cuban girl in the 1990s who, with her family and neighbors, flees in a homemade raft to the United States at great peril. Finally is a Syrian boy whose home is bombed in a country at war. He and his family travel a great distance to find a country that will allow them shelter. Gatz skillfully connects all three stories with a satisfying, realistic conclusion. I couldn’t put this book down! It’s an eye-opening, powerful story of growing up, immigration, and courage. Missing his older brother, 12-year-old Manuel decides to leave his family’s farm in Mexico for the United States. He, like many others, hitches a ride ON TOP of the speedy freight trains heading north. And, yes, it’s as scary and dangerous as you would think times 100. He’s trying not to fall off but he’s also worried about gangs and police — which turn out to be big problems when both groups at different times beat Manuel badly. In fact the gang attack leaves Manuel near death. Thankfully, in both instances, kind people help him recover so he can continue on his journey. All in all, it takes four years to just arrive at the border. And talk about tense, rising action as he attempts to cross the border! But, he makes it and finds his brother in L.A. There, he feels lonely. It’s a big city. His brother works nights and has a girlfriend. Manuel thinks of his abuela’s advice and tries to figure what his direction in life should be. I won’t tell you what he decides but it’s a heartbreaking yet satisfying ending. Fadi and Mariam’s parents illegally flee their home of Afghanistan and emigrate to the United States but events happen that leave Mariam behind in Afghanistan while the rest of the family escapes. 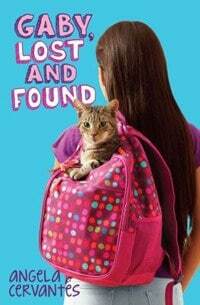 Gaby’s mother is deported, her dad is distant, and Gaby longs for the love of someone; maybe a lost kitten will help her find her way. Sweet and very moving. Kek immigrates to America only to be separated from his mother. He’s sent to Minnesota where he makes friends with a foster girl, an old woman, and a sad cow. It’s a powerful story about the challenges of immigration, survival, kindness, and finding a new home. Zitlally’s dad has been arrested and deported back to Mexico. As she waits anxiously for him to come back via an illegal “coyote,” she befriends a maltreated dog named Star. Is it possible for the daughter of a migrant farm worker to be friends with a town girl? And what about entering the local blueberry queen contest? Lord thoughtfully explores the topic of immigration and migrant workers. Written in a diary as letters to her Mama, Nisha shares how her life is turned upside down when the British rule of India ends in 1947, splitting the country into two — the Muslim north where she lives becomes Pakistan and the Hindu south remains India. Even though Nisha’s mom was Muslim, Nisha, her brother, her doctor Papa and her grandmother are forced to leave their home in the north because they are Hindu. There’s violence everywhere; nowhere is safe, not even the trains. It’s a harrowing journey and confusing time. This story, filled with historical significance, is masterfully told. You won’t want to put this one down. 15- year old Victor wants to help his family in Mexico by working in the United States. But first, he must survive the dangerous journey to get there. This is a wordless, evocative graphic novel showing one man’s journey from his old country to a wonderful and strange new country. Having left her home of Sudan, Viola remembers her old world while trying to understand her new reality in the United States. Written in verse, this novel about immigration and growing up will help kids understand the challenges of arriving and living in a different culture. Sundara left the war in Cambodia four years ago to migrate to the U.S. She finds it difficult to be both American and Cambodian. Thank you for this list, I will definitely be referring to it again. I do recommend changing the language from illegal/legal to undocumented/documented. I’d also like to suggest “Messages From Maryam,” by Lauren Pichon. It’s a children’s picture book about refugee kids from Iraq. It’s available on Amazon. Some very special books here – I recently shared Home of the Brave with my son – so beautifully written! And I will look out for Children of the River – that one’s new to me. Thank you for sharing on the Diverse Children’s Books link up. thanks for stopping by, Marjorie!